I made myself a new skirt last week, and I love it! 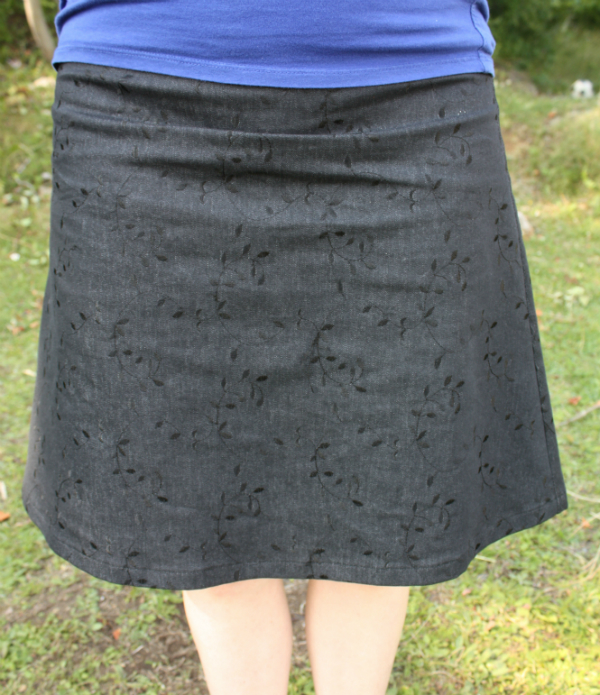 The pattern is the Delphine Skirt from the book Love at First Stitch. It went together very easily, even considering I adjusted the pattern to account for my waist fitting a larger size than my hips. I made the larger waistband, but actually find the waist is a little bigger than I need. Not so big that it's falling off, but just big enough that it can spin a little throughout the day. Next time I'll make the waistband a size smaller. The skirt features an invisible zipper, which sounded rather intimidating. I've sewn zippers into bags before (twice), but I figured this would be harder and it was, though not by as much as I thought it would be. Of course, it took me 3 1/2 tries, mostly because I put it too low in the skirt on my second try. In the end, I'm really pleased with how it looks, especially since the waistband seams are almost perfectly matched! 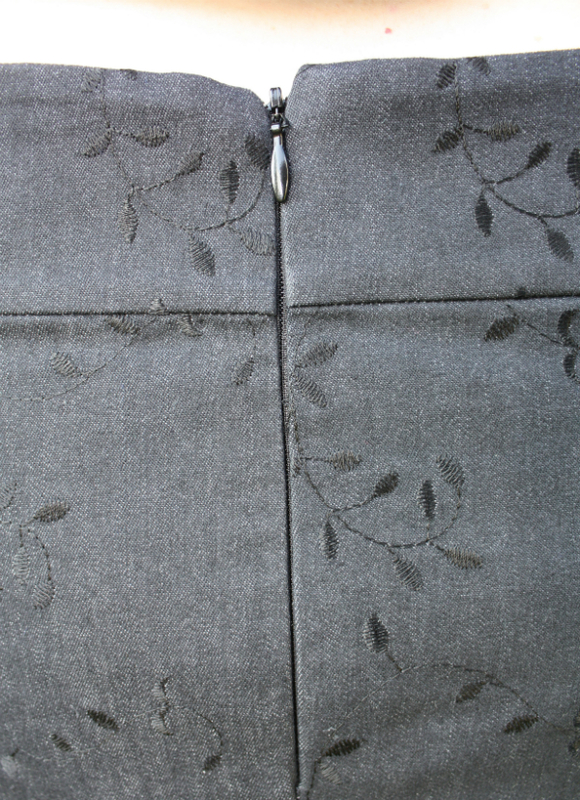 When I turned the facing for the waistband, I did a much nicer job on one corner than the other, which is why the top of the left side of the zipper looks lower. I figure I'll mostly be wearing the skirt with a shirt out over it, so no one will ever see the uneven top of the zipper. As a quilter, I'm used to a seam allowance that only measures 1/4", but sewing clothes requires a 5/8" seam allowance. It looks huge! Look at all that fabric sticking out to the right of the presser foot...when I'm quilting I use a slightly narrower foot and the fabric goes right along the edge of the foot. I think keeping that seam allowance even was almost as daunting as the zipper! That's two projects from the book now. The first was a pair of pajama shorts that I haven't gotten around to photographing yet, though I've been wearing them ever since I finished them. Next up is a dress. The fabric is ordered and once it arrives I'll have to work up the courage to tackle more new skills...like sleeves and darts...oh, and another invisible zipper. Learning new things is fun! Way to go with that zipper. I recall my first zipper in a 4-H club 50 years ago. It was 22 inches long, not invisible and I had to unstitch it twice before gettin git right. and then I never ever used the zipper because the large scale floral brown and orange hop sacking print dress had a wide neckline and I just slipped it over my head. I wore it o high school for at least 4 years. 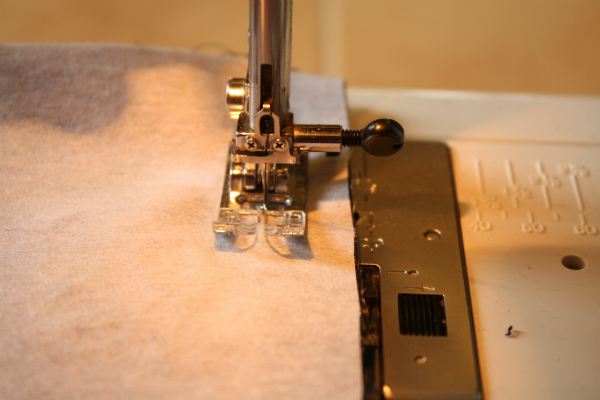 I learned to be patient with that seam ripper since it too has become one of my most used sewing gadgets. I've got that book, too! Hubby bought it for Christmas. But I haven't made anything from it yet. Your skirt looks great! Good job! It looks great. Love the fabric you used. Leanne, your skirt is really cute on you! Zippers and I have never been friends, so I appreciated seeing ones that turned out perfect. Congratulations on a fab finish Leanne and mastering the art of inserting that zip. The skirt looks fabulous, Leanne! Good for you breaking out and tackling all these clothing items. The pj's sound comfy... I prefer to wear mine all the time, too! You did a great job on that skirt! I've been wanting to tackle some new clothes myself. You are braver than I! The denim was perfect for the skirt. Looks great! You did a fabulous job with the skirt Leanne, it looks so good! I love that you make things to wear, I'm not nearly that brave!